handplant studios: Sponge Dude and the Alien Hippies - now available!!! Sponge Dude and the Alien Hippies - now available!!! SpongeDude has just been reviewed by the Apple team and is now available for sale on the Appstore. Make sure to watch the cool YouTube video. Sponge Dude is an addictive Action&Puzzle-Game featuring a unique physic-based Interface. Pilot the alien sponge head and his hippie friend through 26 challenging levels and adventures. as possible. During hie adventure he will meet scary enemies and unexpected friends. Sponge Dude misses arms and legs - under earth gravity he only manages to do little mostly useless jumps (tap). 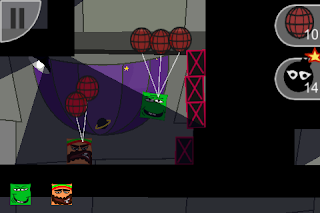 So help this little dude: use bombs to blast him through the air, lift him into the air using balloons and much more. Using the two-fingure gesture you can zoom the game and get a fast and easy overview about the surrounding area. - Cutting-edge physic system for action and enchaining puzzles. - Multiple worlds with 26 levels. Dive into the crazy adventure of Sponge Dude - and the Alien Hippies!